There’s a lot of activity going on behind the scenes as our legal cases slowly march through the court system. We’re still months away from any sort of resolution, but I hope to have some good news to tell you in about a week. Meanwhile, here’s a quick update on what’s been going on. Attorney General: e-mail recovery should be complete in five weeks. After being denied access to more e-mails from the attorney general, we filed an appeal with its appeals officer. Since Kathleen Kane’s well-publicized e-mail recovery is ongoing, it asked us to withdraw our appeal and file it later. Instead, we greed to give them an extension. The OAG says its e-mail recovery should be complete in about six weeks. The deadline for it to make a decision about our appeal is now May 23. Last week we asked the Commonwealth Court for an opportunity to pursue discovery against Penn State. As you know, the key issue in this case is whether Penn State waived the attorney-client privilege with regard to communications with Cynthia Baldwin and Louis J. Freeh. Despite the fact that the university allowed Freeh to discuss his activities with four law enforcement agencies and the NCAA, lawyers are claiming that Penn State did not waive the privilege. If the court grants our request, we’ll have the ability to send questions to Penn State and depose administrators to determine whether the privilege was waived. It sounds silly, but that’s what we said in the most recent filing in our case against the Philadelphia District Attorney. The DA’s office took issue with our complaint, arguing in so-called “preliminary objections” that we should have believed its attorney when he said it didn’t have the records we asked for. We filed our own “preliminary objections,” arguing that it can’t object based on the grounds that it chose. I think they might be able to object again, but at some point in the next few months a judge will have to decide whose objections are most objectionable. After that, we’ll be able to conduct discovery and find out why the DA’s office isn’t being honest. As you may know, for a third (and final) time, I’m seeking a seat on the Board of Trustees. Quite often, I hear people say they won’t vote for me because they believe some members of the Board of Trustees will make the Sunshine Fund’s activities stop. The claims are never explained, so it’s difficult to understand where this idea comes from. But allow me to try and end this ridiculous notion once and for all. There is absolutely no chance that being elected to the board will have any impact whatsoever on the current legal proceedings. No rule, regulation, policy or law prohibits me from continuing what I’ve started. 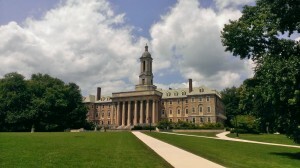 Furthermore, the only case involving Penn State will be argued months before my term would begin. Since day one, I’ve sought facts that will help us understand and expose why the Board of Trustees allowed Louis Freeh to get it so unbelievably wrong. While nibbling at the edges has been fruitful, nothing will ever compare to having direct access to information that all trustees are entitled to have. If elected, my primary goal is to review records of Freeh’s investigation. No other candidate has pledged to do that. The sitting trustees have had three years to do it, and they haven’t even tried. I have a plan to get us to the point where we can begin to heal. And I need your support to get us there.